Sappington-Concord Historical Society sponsors a variety of events for its members and the public. Some are held on a regular basis and some are special one-time events. SCHS has several types of programs. The one program with a set schedule that never changes is the SCHS general meetings held quarterly in January, April, July and October. The following is a list of all up-coming events in chronological order. The events are listed chronologically and by season, winter, spring and so on. Venues for the event are noted clearly with a photo. Some events have a link to a separate page with more information about the event and related resources on the topic. January 12, Thursday, 2017, 7:00 pm See evening agenda below. Sperreng Middle School Please note that the date for this event is on a different night, this SCHS general meeting and presentation will be held on a Thursday night. Notice the venue will be at the Sperreng Middle School on Tesson Ferry Road at Concord School Road. Doors open at 6:30 pm for members and visitors to see displays and exhibits, and to meet the speakers for the evening. 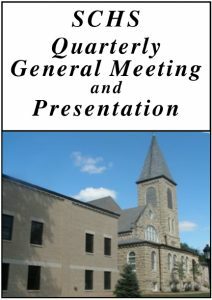 There will be a brief business meeting at 7:00 pm finishing about 7:20, then refreshments are served followed by the presentation on outhouses. Doors close at 9:00 pm. Meet-at-the-Site Tour date changed to Jan 21, Saturday, 10:00 am because of the weather – see more info on the tour below. Meet-at-the-Site Tour to the Jefferson Barracks Telephone Museum. The admission fee is $4.00 per person with a discount if we are a group of over 10 people. Meet at the entrance to the museum at 10:00 am, or drive together with friends from St Lucas UCC church east parking lot, meeting time 9:00 am, depart at 9:15 am. “1904 World’s Fair” by Dan Fuller from Bellefontaine Cemetery. Home of the Louisiana Purchase Exposition, St. Louis hosted the most unforgettable of World’s Fairs. Many of those instrumental in securing the honor as well as those who made the Fair happen call Bellefontaine their final resting place. Whether discussing David R. Francis, President of the LPE or Isaac Taylor, Lead Architect of the fair many interesting stories can be told of their impact on the Fair and the region. SCHS Daytime presentation at Grant’s View library, “Adeline” by master storyteller and author Gladys Caines-Coggswell. The story of Adeline, a slave in Savannah, Missouri. Adaline was present to hear Abraham Lincoln debate political opponent Stephen Douglas and was freed after the Civil War, yet she chose to stay with the family to which she had been sold. This performance is presented by the Missouri Humanities Council, Grant’s View Branch library and SCHS. See more info on Adeline web page. Presentation geared to adult audience. See library event web page. “The Archaeological Dig at Sappington House,” a talk on the archaeological dig at Sappington House by anthropologist, Rachael Azzara. Presentation held at Grant’s View library. Discussion of what was found at the June 2016 dig at Sappington House by the team of archaeologists and high school students, what the findings might tell us, and what may be found in the 2017 three week dig in June. “What’s with St. Louis?” book and presentation by Valerie Kienzle. St. Louis is known by many names, including Mound City, Gateway City, The Lou, River City, St. Louie, STL, and Gateway to the West. Whether you’re a newcomer or a lifelong resident, St. Louis has much to offer. Like a colorful patchwork quilt, St. Louis is made up of an assortment of people, neighborhoods, activities, and influences that together contribute to its unique character. What’s with St. Louis? provides a glimpse at life in this unique Midwestern city, from food, weather, and sports to treasured architectural jewels and quirky St. Louis-isms. St. Louisans embrace diversity, value educational and cultural institutions, and love a good celebration. Think you know everything about this city with the gigantic arch? What’s with St. Louis? tells the rest of the story. “Missouri Veterans History Project” by Carl K. Sherman from the the Missouri Veterans History Project. Learn what the Missouri Veterans Project is, that it is a part of the Library of Congress and that it is an effort to capture veterans’ stories regardless of era or conflict. The veteran that is interviewed, receives a free DVD of the interview. Then another copy goes to the Library of Congress, and a third is sent to the Missouri Historical Division. A sign-up sheet will be passed out for those veterans interested in taking part in the Missouri Veterans History Project. The veteran’s story becomes a legacy gift to his or her family and to the nation for posterity. Talk on the archaeological dig at Sappington House by anthropologist, Rachael Azzara. What was found at the June 2016 dig at Sappington House by the team of archaeologists and high school students. What the findings might tell us. What may be found in the 2017 three week dig in June. SCHS SCHS Family History and Fun Night. Meet five historic local families, hear their stories and see their photos. The families are featured in the SCHS Green book; “Sappington-Concord: A History.” Other activities for the evening are just for fun, including meeting Hamilton, the man and the Broadway play. Members can also bring photos of family that they can share on the family photo display table. Think of some stories of your family before coming. Location: The Family History and Fun Night will be at the Sperreng Middle School in the cafeteria in the lower level. Enter the doors on the lower level. Parking is convenient and nearby. Handicap parking for those cars with handicap license or handicap mirror hanger. Exhibit of artifacts from the June 2016 archaeological dig at Sappington House. Almost 1,000 artifacts were found in the June 2016 archaeological dig at Sappington House. This selection of artifacts is shown with identification labels. “The History of the Muny Opera” by Laura Peters, for 22 years the Marketing Director for The Muny, is currently its official Archivist and Historian. She is charged with compiling the Muny’s History…from Archibald Leach (Cary Grant) to Flo Ziegfeld! Laura has designed a presentation outlining that fascinating and glamorous history to share with Crestview residents. We invite you to join us with your own stories, and Laura will be happy to tell you everything you ever wanted to know about America’s oldest and largest outdoor musical theatre! The Eugene Field House Museum is the destination for the Spring SCHS Meet-at-the-Site Tour, 634 S Broadway, St. Louis, MO 63102. Meet at the house at 10:00 am. The admission fee is $10. We will get an overview orientation of the facility first, then go through the displays in the museum and finally get a guided tour of the Eugene Field home. 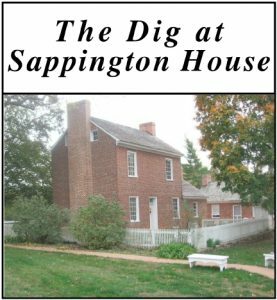 “The Archaeological Dig at Sappington House,” a talk on the archaeological dig at Sappington House by anthropologist, Rachael Azzara. Presentation held at Oak Bend library. Discussion of what was found at the June 2016 dig at Sappington House by the team of archaeologists and high school students, what the findings might tell us, and what may be found in the 2017 three week dig in June. “How Local History Can Help Urban Communities Prepare for Climate Change Impacts” by Prof Andrew Hurley from UMSL at 2:00 pm. See description of the talk. “Baby Teeth and the Bomb: The St. Louis Baby Tooth Survey and the Legacy of Atomic Weapons” by David Lobbig from the Missouri History Museum at 3:00 pm. See description of the talk. The talks by Andrew and David are part of the Regional Environmental History Speaker Series running from Monday afternoon to Friday night, April 21. The 7 presentations, are at 6 venues over 5 days. 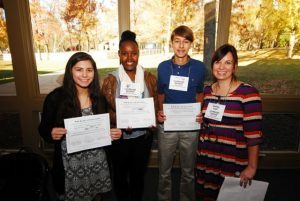 See the other speakers, topics and venues at Regional Speaker Series. 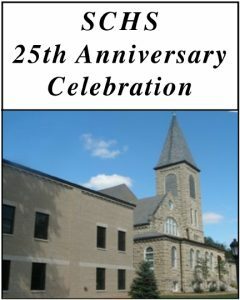 SCHS 25th Anniversary Celebration at St Lucas UCC Church Social Hall. The 1940’s style swing band the Queens of Swing play and give historical narration. See directions to St Lucas UCC Church. April 29, 2017, Saturday, 10:00 am. Ride Grant’s Trail, part of Great Rivers Greenway, starting at the US Grant National Historic Site, adjacent to Grant’s Farm. Tour the Grant home, jump on your bike to Sappington House to see the Country Craft Fair and get a complimentary tour of the historic home. Learn about history along the trail including the railroad that predated Grant’s Trail. Free and open to the public. Reservations required by calling 314-842-1867. Event hosted by the National Park Service in partnership with Sappington House and the Sappington-Concord Historical Society. “Air Travel, from Biplanes to Passenger Airliners” by Ken Velten, retired from Boeing and Adjunct Faculty at St. Louis Community College. The Wright Brothers first showed the possibility of powered flight in aircraft carrying people in 1903 but the airline industry developed slowly until the 1930‘s. There are great stories about the industry as it transitioned from fabric covered biplanes to metal four engine airliners capable of crossing the oceans. This lecture will cover the airplanes, the men and the airlines that created the airline industry. The development of airlines like TWA, American, Pan Am, Eastern and United will be shown. Airplanes like the Curtis Condor, the DC3, the Pan Am Clippers and the DC 6/7 and the Constellation will be discussed. And the pioneers like CR Smith, Juan Trippe, Eddie Rickenbacker and Howard Hughes will be covered. The time period will be from the 1920’s to the beginning of the jet age in the 1950’s including the role of the airlines in WWII. Where in St. Louis can you. . .
. . picnic at a radioactive waste dump?
. . . learn what West County Center’s famous dove really represents?
. . . visit the grave of the man who burned Atlanta?
. . . join a nudist resort?
. . . view a cube comprised of a million dollar bills?
. . . see a piece from New York’s Twin Towers?
. . . find out exactly what a Billiken is? Whether you are piloting a simulated barge on the Mississippi River, exploring the hidden history of Abraham Lincoln’s bizarre sword fight in St. Charles County, or eating a ten-pound apple-pie in Kimmswick inspired by the Great Flood of 1993, it is hard to get bored with a copy of Secret St. Louis: A Guide to the Weird, Wonderful, and Obscure. By turns wistful and whimsical, this is a book that answers the questions you never knew you had about St. Louis while taking readers on a whirlwind tour through ninety-seven unique but little-known spaces and places that can’t be found anywhere else. A tourist handbook for people who thought they never needed one, Secret St. Louis provides a scavenger hunt of hidden gems traversing the somber, strange, surprising, and silly locales which define the culture and history that make St. Louis such a diverse and amazing place to call home. From Weldon Spring to Wildwood, Overland to O’Fallon, Bellefontaine to Bridgeton, this is an exploration of St. Louis’s odds and ends like no other. See more at Reedy Press web site. See more about Memorial Day 2017. See more on web page about Memorial Park. On the grounds of the Sappington House in Crestwood. 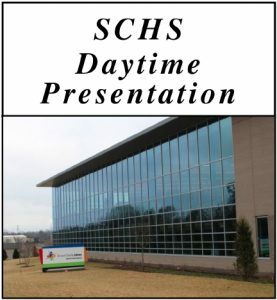 SCHS at Friendship Village Sunset Hills – Rhineland Room in the Crossings building. “A Short History of the US Navy” by Ken Velten, retired from Boeing and Adjunct Faculty at St. Louis Community College. The United States Navy got its start during the Revolutionary War, came of age fighting the Barbary pirates and in the War of 1812, had a split personality during the Civil War and finally was the major player in the Spanish American War. During this time the US Navy transitioned from sailing wooden ships firing solid cannon balls to steam powered iron ships firing exploding shells. This brief presentation will cover the men, the ships and the battles that form a rich history of the American Navy. Included will be heroics of John Paul Jones, the exploits of the USS Constitution, the historic battle of the ironclads, the USS Monitor and CSS Virginia (Merrimack) and Admiral Dewey’s victory in Manila. SCHS at Friendship Village Sunset Hills – Rhineland Room in the Crossings building.“Reviving the Legacy of Annie Malone” by Linda Nance, president of the Annie Malone Historical Society. This story is one of a nearly forgotten icon of the Black Hair Care industry and focuses on the historic Poro College. Annie Malone’s incredible business acumen, generosity and outstanding philanthropic efforts gave much to the City of St. Louis, the State of Missouri and the World. The presentation will uncover interesting details about the “Poro System” and it’s impact on the economic development for people of color around the world. SCHS general meeting and presentation “The Missouri Pacific Railroad in St. Louis County” by Nick Fry curator of the Mercantile Library’s John W. Barriger III National Railroad collection. The presentation will cover the earliest predecessor lines, from the Pacific Railroad of Missouri and the Iron Mountain, to the modern era. Doors open at 6:30 pm for members and visitors to see displays and exhibits, and to meet the speaker for the evening. Refreshments, 6:45. 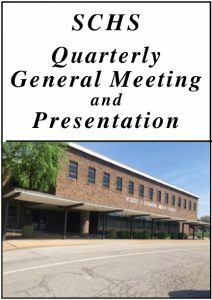 There will be a brief business meeting at 7:00 pm finishing about 7:20 followed by the presentation on railroads. Doors close at 9:00 pm. Charley Klipsch and his club provided the doves of peace to the 2017 SCHS Annual Memorial Day Ceremony on the green at St Lucas. Charley has invited us to visit his home to see his pigeons. He will show us how he cares for his birds, show us their loft and we can watch the pigeons in an exercise flight. Learn about pigeon racing and the clocking system. Free event. RSVP at the July 26 meeting or by email to Stephen at schs.webmanager@gmail.com by July 28 at 5:00 pm. Location and address announced at time of RSVP. The Society presented a plaque recently to the Lindbergh Schools for the new Dressel School. This was not a new plaque, but the original plaque from the first Dressel School which was stored in the SCHS archives for some years. The plaque has been restored and replaced on the newly rebuilt Dressel School along with the new plaque for the new 2017 school. SCHS members and the public are invited to attend a community open house featuring building tours of the new Dressel School on Wednesday, August 2 from 4:30 to 6:30 pm. The event is free and open to the public. It is recommended we use the upper parking lot. We meet outside the Barrett Station Road entrance, the brown building (there is a boat and a plane near there) at 9:45 am. We pay together and enter. We then join the free guided tour at 10:00 am. The entrance fee is $8.00 per person. Walking is required, some up hill. The facilities are wheelchair and walker accessible. Please sign up for the tour at the SCHS general meeting on July 26 or email Stephen Hanperter at schs.webmanager@gmail.com. To share driving to the site, meet at St Lucas UCC church east parking lot at the end of the lot by the recycling containers. The gathering time at St Lucas is 9:00 am and departure is at 9:15 am. See directions to St Lucas UCC. “Lost Treasures of St. Louis” – Cameron Collins speaks on his book of the same name. A kaleidoscope of bygone places, events, and items once identified with the Gateway City, Lost Treasures of Saint Louis captures the essence of cherished times that still resonate with St. Louisans. Lost Treasures celebrates dancing to Ike and Tina at the Club Imperial, Bowling for Dollars at the Arena, taking in movies at Ronnie’s Drive-In, and myriad other pastimes enjoyed through the years. Rarely seen photos and artifacts revive eateries like Miss Hulling’s Cafeteria and the Crystal Palace, entertainment and sports attractions like the Goldenrod Showboat and Sportsman’s Park, retail stores like Famous-Barr and Scruggs, Vandervoot and Barney, community establishments like Cleveland High School and St. Bridget of Erin Church, and locally manufactured products like Mavrakos Candy and Falstaff Beer. Gone but not forgotten, all of the subjects featured elicit nostalgia and also reveal how the past has shaped our city. “Colorful Characters of St. Louis” – Jim Merkel speaks on his book of the same name. To sell more furniture for Schweig Engel, Mike Stein made crazy TV commercials. To protest racial inequality in the construction of the Gateway Arch, Percy Green and a friend climbed a ladder 125 feet up the side of the unfinished monument. When a German immigrant bought a local baseball team, he used a scantily clad band and a Wild West Show to draw fans. Welcome to a world of mavericks, outcasts, innovators, eccentrics, and other unforgettables who defy convention. This book highlights the people who’ve worked overtime to make sure that St. Louis could never be boring. Assembled and brought to life by master storyteller Jim Merkel, the cast includes a rich and endless assortment. See artifacts unearthed from Sappington House’s summer kitchen and cistern – china, glassware, buttons, animal bones, bullets and more. Learn about early American historic archaeology in St. Louis. Hear the 12 noon performance of dramatic poetry and prose popular in 1810! Get in the act with tomahawk throwing and musket shooting. Kids will have fun at the Young’uns Outpost, with a costumed passport program for craft activities. Free admission and parking across the street at Crestwood Elementary and in the overflow lot off Reco Avenue. Co-sponsoring this event with Sappington House are; the Sappington-Concord Historical Society, American Archaeological Institute of America (AIA) (St. Louis society), and the Archaeological Research Center of St. Louis. For more information, phone 314-822-8171, or Stephen at 314-918-1617. October 26, 2017 Thursday, doors open at 6:30 pm, meet the speaker, see the displays. This year, 2017, marks the 100th anniversary of America’s entry into the “Great War” in Europe, WW I. The world we live in today was in many ways created by this devastating and shocking war. The First World War is usually remembered for the battles fought in muddy trenches, but there was a war at sea fought around the world. World War I featured Jutland, the largest battle fought on the high seas between battleships. This presentation will detail the events leading up to the War, the new technology developed prior to the war and the battles at sea fought during the war, especially Jutland. The introduction of a new weapon, the submarine, will be discussed. Finally, the aftermath of the war and how it influenced the next war, WWII, will be explored. You’ll gain an appreciation of the role sea warfare played in World War I and how victories at sea influenced the results of the war. 634 S Broadway, St. Louis, MO 63102. Meet at the Field House at 10:00 am. The admission fee is $10.00 and if we are a group of five or more, it is $9.00 each. We will get an overview orientation of the facility first, then go through the displays in the museum on our own and finally get a guided tour of the Eugene Field home. There will be a pop up book display in the library. Drive yourself to the site or to share driving, meet at St Lucas UCC church in the east parking lot, by the recycling containers. The meeting time at St Lucas is 9:00 am and departure is at 9:15 am. RSVP to Stephen at 314-918-1617 or schs.webmanager@gmail.com by Wednesday night at 9:00 pm, please. Explores the story of Jefferson Barracks from its establishment through the turn of the 20th century. Learn about the Post’s founding, its famous residents, and pivotal events like the Blackhawk War, founding of the U.S. Cavalry, and the first successful parachute jump from an airplane. Please make your reservations by October 26 at the general meeting. Hear the high school students report on their finds, experiences and research related to the summer 2017 dig. Reception follows with display of artifacts found in 2017 dig. Lindbergh Schools will dedicate its new Central Office building this December. This date has been pushed back to summer 2018. Watch for the date and time to be announced on our Facebook page and website (SCHS.ws). The Sappington-Concord Historical Society played an important role in preserving the history of the site by donating a commemorative plaque to the school district, which will be showcased in the main lobby area. The plaque celebrates a long history of “Community and Commerce” at the corner of Sappington and Denny roads, including Johnny’s Market most recently. Lindbergh Schools looks forward to celebrating the opening of this new building with a ribbon cutting ceremony and plaque dedication. Every year at this time, we thank you for your membership in SCHS for the year. Without you, we don’t have any shared history, we don’t have anyone to share great history events with, nor do we have the funding your membership fees provide. Though the fee is small, $10 per year for an individual and $15 for a couple, your contribution is critical. In this year of our 25th anniversary, we received the bequest by Ross Wagner of his house and farm. Developing and maintaining the Ross Wagner History Center will require funding beyond membership dues. Please consider a special year end gift to SCHS. The board meetings are held on the second Wednesday of the month at 1:30, usually in a meeting room at Lindbergh High School.